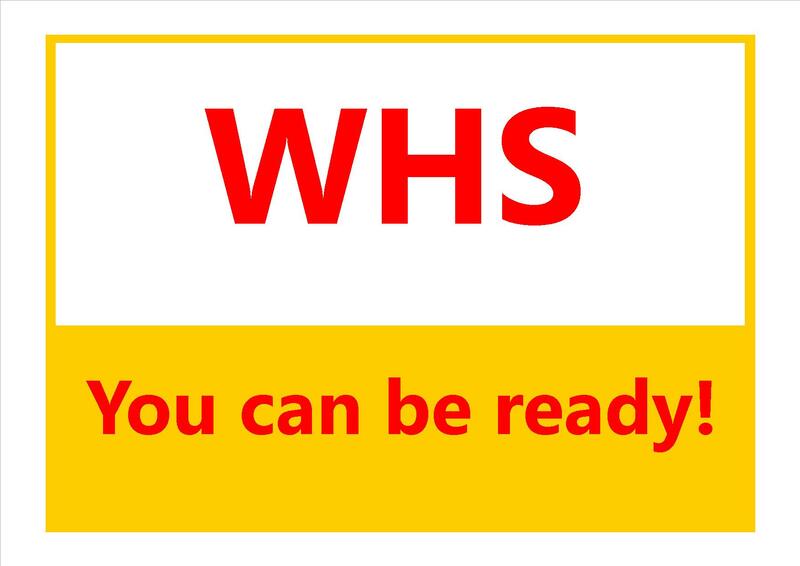 WHS – how can I be ready? One of the toughest questions facing businesses in the final quarter of 2011 is ‘how can I be ready for something if I don’t know exactly what it is’? At Australian Fire & First Aid we are here to help, we have reviewed a wide variety of documentation available from various sources and industry bodies around the country and have also attended seminars so we can combine the best bits of that advice for you here in one place. To create this blog article we first sat down as a team and brainstormed our best advice that we have been providing to our clients. Next we compared our ideas to the advice being offered by official government bodies and industry sources to ensure we were on track and providing current and correct information. We also reviewed a wide variety of articles from unofficial bodies to see if they had suggested anything we hadn’t thought of. We found that everything we had thought of had already been mentioned somewhere on the internet, we also found that no single site had a list as comprehensive as we are about to provide. For this reason we will not be crediting every department, body, source or blog we have reviewed to get to this point. Instead we have chosen to provide you with links to the government safety agency/body in all Australian States and Territories and other relevant links which will assist you in being prepared and moving forward . STEP 1) Immediately set aside some specific time for your ECO, Safety Representatives, Business Owner or other applicable person/s to review your current policies and procedures. Compare them to the current OHS laws by which you are bound. Do you meet the current standards? The national harmonisation laws will not be too different from what is currently in place in most states. From the information we have received the ‘what’ & ‘who’ of safety won’t change as much as the ‘how’. Ensuring you are compliant with all current legislation is a great place to start. STEP 2) Set aside some time at the very beginning of 2012 for the health and safety representatives and other key stakeholders of your business to meet, review and discuss the changes that have occurred. Be prepared to issue communication to all staff about any changes that affect your workplace. This would be a great time to discuss available communication strategies, how cost effective they are to implement and if they will succeed in meeting your target audience. STEP 3) Set aside some funds for the first quarter of 2012 for WHS education. There are and will be many free seminars available nationwide from government bodies (see links below) regarding the changes but these book out extremely quickly and you should be prepared to pay for training if free training is not available. Discuss the types of training that may be required and the number of people who may require it to set a realistic budget. You will see from our tips below that many forms of training are required and should have already occurred. STEP 4) Consider conducting a site inspection concentrating on the 14 points below, if you are time poor or unsure of how to properly assess your current situation outsource to a reputable company. The following is listed in alphabetical order, the order each category is listed in should not be taken as a sign of each aspects importance. 4) Fire – Do you have access to the required amount of portable fire fighting equipment? Has the equipment been maintained in accordance with standards and all registers relating to servicing up to date? Is your staff TRAINED to operate the equipment or act as a warden in an emergency? 5) First Aid – Do you have the required number and type of TRAINED First Aiders? Do you have the required number and correct type of First Aid Kits available, are they stocked and does each contain appropriate record keeping information? 6) Forklifts – Are all operators appropriately TRAINED and currently licensed? Have safety issues been identified & recorded and are they being followed such as wearing of seatbelts and use of reverse tones, lights and sound signals for movement throughout the business premises? Ensure your vehicle(s) is well maintained and all faults are rectified immediately. 7) Height – Do you have appropriate handrails, industrial ladders & clear access? Are youn oeprating from a stable platform? Is appropriate footwear and if part of a multi-tiered construction, headwear being worn? Have all reasonable measures to prevent a fall been taken? 8) Machinery – Ensure all machinery is in safe working order & operators are adequately TRAINED. Ensure all by products of powering or operating machinery such as fuel, wood chips, swarf or similar are appropriately managed for safety and environmental factors. Determine if powered equipment needs/meets tag & test requirements. 9) Manual Handling – Evaluate the need for staff to be TRAINED in manual handling procedures. Consider signage to encourage best practises where manual handling is a frequent occurrence. Evaluate high risk handling operations and seek eliminate them or find alternatives. 10) Noise – Have all efforts been made to reduce noisy undertakings where possible? Ensure noise reduction equipment is appropriate, well maintained and available to all affected persons on or near site. Is decibel testing (otoacoustic emissions testing) required & up to date? 11) PPE – Determine what Personal Protective Equipment is required for your site and ensure it is available. Ensure all PPE meets current standards, is in good repair, fits well and is accessible to those who may require it. 12) Records/Registers – Have records relating to TRAINING, near miss reports, hazards, accidents, site meetings etc been stored for correct periods & in the correct manner? Do you have & use registers for site visitors, chemicals (MSDS), asbestos, training or other areas which require a register? Is the information within current? 13) Storage – Clear access to paths, to and from surrounding areas and ensure storage areas are free of clutter. Check that installed systems are correct type and strength for items being stored, locks where required are available and in working order and being used. 14) Surface Maintenance – Ensure all walkway surfaces are cleared of debris & clutter, cords, cables and other tripping hazards are removed. Ensure surfaces are non-slip where possible and signed elsewhere and appropriate footwear is worn at all times. Assess condition of surfaces for maintenance requirements including pot holes, uneven broken concrete, frayed carpet, and mould build up or other potential health or safety hazards and address immediately or outsource to an appropriate agency. The 14 key areas of self-assessment for small businesses (above) is a useful tool to be distributed to the OHS representatives and management at sites or departments of larger businesses. The following information has been listed in alphabetical order, the order each category is listed in should be not taken as a sign of its importance. 1) Accountability – Identify key safety stakeholders in your business, ensure responsibilities are clearly documented, understood and accepted. Provide TRAINING where appropriate to elected position holders. Ensure reps are known to all (safety board) and accessible. 2) Consultation – Consult with staff and other key stakeholders regarding health and safety issues on a regular basis and ensure appropriate channels are established for feedback and commentary. 3) Hazards & Risks – Eliminate all possible hazards and risks from operations, minimise the impact of those unable to be eliminated by way of training, procedures & supply of safety equipment where reasonably possible. 4) Injury Management – Ensure return to work programs are managed by competent trained staff (Return to Work Coordinator) or outsourced to a suitable agency. Ensure consultation occurs to inform injured parties of available options and services. 5) Planning – Include relevant policies on health and safety in your businesses strategic plan/mission statement. Assess corporate infrastructure to ensure resources are available and adequate to carryout duties and achieve targets as described in policies. 6) Reporting/Records Management – Ensure all reports of serious hazards, risks, injuries and claims are reported through appropriate channels to correct management levels. Assess record keeping of reports to ensure compliance with current legislation. 7) Training – Ensure elected and volunteer OHS representatives, Return to Work Coordinators and OHS staff are appropriately trained to undertake prescribed duties. Re-evaluate positions regularly to ensure above are capable and willing to fulfil role responsibilities. As mentioned previously there are a number of bodies and organisations across Australia who are regarded as experts in the matters of OHS & WHS. Free training seminars are being run regularly to inform the business community and wider public of the proposed national harmonisation of WHS. Please speak to your local official government department for further information or clarification of WHS. ← WHS – who will enforce the new laws?